Histologic Description: This is a highly cellular spindle cell neoplasm, with occasional mitotic figures. The neoplasm permeates bone, which suggests an aggressive process. 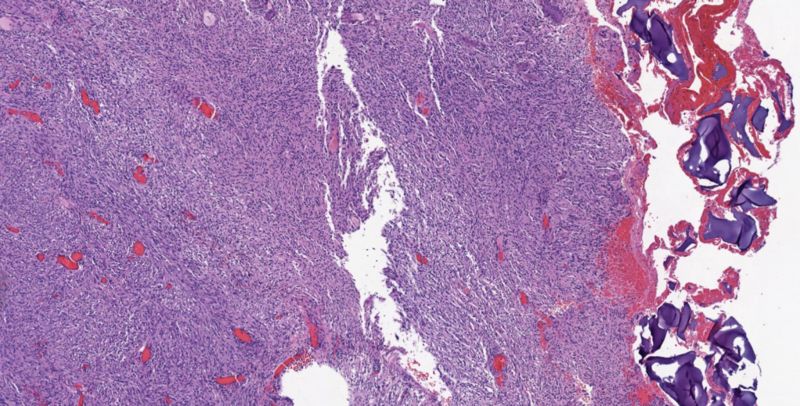 The neoplasm is diffusely immunoreactive for S100 protein, and other areas demonstrates the hyalinized vessels and lower cellularity typical of schwannoma. Differential Diagnosis: Rhabdomyosarcoma would label for myogenin and desmin, it would have more eosinophilic cytoplasm. Leiomyosarcoma would demonstrate more eosinophilic cytoplasm and label for desmin. Malignant peripheral nerve sheath tumors are typically not diffusely S100 positive like schwannoma, and demonstrate greater atypia and mitotic activity. Cellular schwannomas may erode bone and demonstrate mitotic activity, mimicking a malignancy.